Lake Charm is a rural village on the Murray Valley Highway, 17 km north-east of Kerang on the way to Swan Hill. The actual lake is one of several either side of the highway which extends north-easterly to Lake Boga. Whilst the name may be descriptive of the lake, it is thought by one authority that it is derived from an Aboriginal word ‘charam’ meaning reed spear. Another authority states that the lake was named after an Aboriginal chief, several of whose tribal members were murdered in reprisal for the killing of two shepherds in the 1840s. The killings caused the lake to be first called Murdering Lake, then Lake Cham (the chief’s name) and subsequently altered to Charm in 1876. 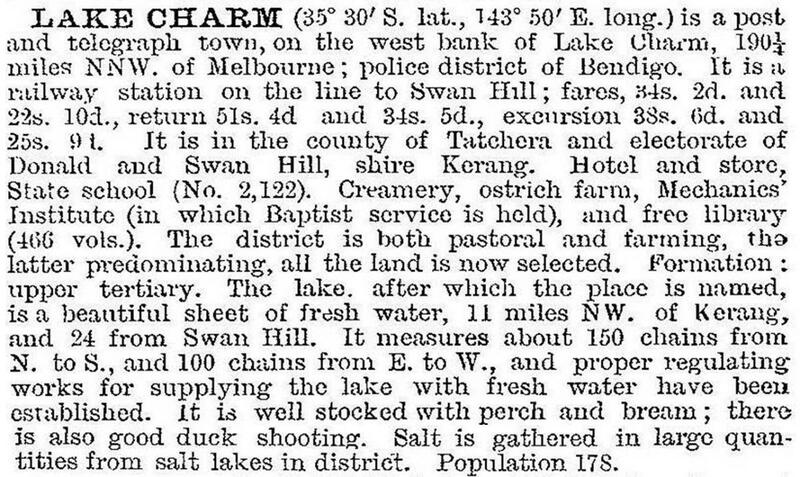 An inn was opened at Lake Charm in 1858, being on the route for a mail and coach service between Kerang and Swan Hill. A store and post office were later added. In late 1860s farm selections were taken up, and a school was opened in 1879. After the railway line was opened through Lake Charm in 1890 dairy produce was more easily marketed, and the local creamery was bypassed for the Kerang butter factory when it opened in 1905. A public hall and mechanics’ institute were opened in 1892. The Baptist congregation was the largest in the district, and a church was built on the village reserve in 1913. An Anglican church was opened in 1928, but closed in 1991. The Lake Charm Hotel, successor to the original inn, closed in 1992. Lake Charm is in the Torrumbarry Irrigation District (c1924), and has dairying and orchards. There are also Kangaroo and Racecourse Lakes, and another from which salt is harvested. Lake Charm is freshwater, and has fishing, boating and yachting facilities. There are two caravan parks. The public hall has celebrated its centenary, and there are a general store and a motor garage in the village. In 2014 there were 17 pupils at the school.